As always, it was tough to say goodbye to Alex. We had a great time all weekend, but this was our last hurrah. We had only one more stop to make before we would be home. As we hitched up Monday morning, it felt like our thinking had shifted. We were no longer deeply immersed in the journey. We were itchy and restless. In four short days, we would wake up in our house in Connecticut. We wouldn’t wake up in our bed in the Airstream, but in our house. We had not yet voiced it, but we had both been feeling and thinking the exact same thing. It was an odd feeling of going through the motions. Before we were completely engaged. The good and the bad moments were deeply felt. Now that feeling of glorious freedom, of unlimited horizons was slowly dissipating. We were no longer the bird on wing floating through the air, we were coming to ground. We talked about this as we drove. I expect this shift in thinking did not happen in one moment. It had been coming on slowly. Our penultimate stop was another Airstream-only park. The Jersey Shore Haven was a stone’s throw from the ocean near Cape May. Like Highland Haven, this park is a cooperative. However, it was quite different from Highland Haven in many ways. Highland Haven is known for having fairly stringent guidelines and rules. Airstreams are not allowed to remain on site during the winter months. There are guidelines about site maintenance. This may feel constraining, but it does promote a neat and tidy campground. Jersey Shore Haven on the other hand, had no such regulations. While it had certain amenities, such as a large swimming pool and bathhouse, some of the Airstreams had been in place for an extended length of time. In fact, some of the Airstreams looked downright abandoned. Jersey Shore was very family oriented. In speaking with two of the shareholders, they explained that the haven was 40 years old and many of the current shareholders were third generation. It did very much have the feel of a family retreat. We had hit another rainy period and the skies were grey and leaden. We were only staying the night at Jersey Shore so we stayed hitched. The rhododendrons were in full bloom. 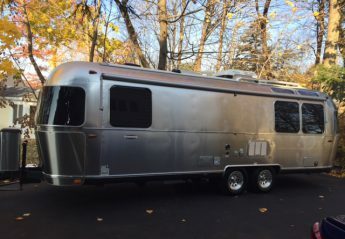 Between rain showers, we walked the roads in the campground and enjoyed looking at the various vintages of Airstreams. We saw models which we had never seen before including a most un-Airstream like Fifth Wheel. After this brief interlude, we hit the Garden State Parkway again on our northward progression to our final stop. Our next stop was the Cherry Hill RV Resort in College Park, MD. This is the closest park to DC and, more importantly, to Columbia, MD. Cherry Hill RV Resort is quite an extraordinary place. First off, it is enormous. There are literally hundreds of camp sites. It has two swimming pools, a water park, a restaurant, miniature golf and a store with rv supplies, food and all sorts of things. Busses run guests to nearby mass transit and into DC proper. They even host nighttime tours of DC. The resort is a sea of Class A’s and Fifth Wheels. During our perambulations around the resorts’ streets, we saw only one other Airstream. When we checked in, the man at the desk asked if we would prefer to be near the bath house or somewhere else. I asked for a quiet spot and we got a lovely site surrounded by trees. It was hard to believe we were in a major urban area. It felt like we were at a secluded state park. Our weekend at Cherry Hill was a very social one. If we had been on our own since early March when we visited Jim’s brother, Jack, and his wife, Phyllis, in Pearland, Texas, we were now in for a full dose of family and friends. Columbia is the town in which Alex, our first-born and family Marine, lives. He works at Fort Meade, but lives with a friend. Alex joined us Friday night and we had a treat-your-child-special dinner in the Airstream. My goal was to make his favorite things which I know perfectly well, he doesn’t usually get to eat. We had steak, sautéed mushrooms and baked potatoes. With some not-so-gentle maternal urging, Alex slept over with us in the Airstream. Saturday we lounged in the trailer in the morning and then headed to see his house in Columbia. It was very good to get a sense of our firstborn’s daily life. We met his room-mate, Rose, the actual homeowner, and Rose’s dog, Archer. Rose is a fellow Marine and seems to be a good friend and landlord. Rose is his last name. I don’t even know his first. I am not sure Alex knows his first name. We were happy to see Alex living in an actual house—much better quarters than the barracks. The house had apparently been cleaned before our visit. It was, nevertheless, a bit of a bachelor pad. Both Alex and Rose are into video games and much more had been invested in monitors and CPU’s than sofas and chairs. Saturday night we traveled down to DC to have dinner at our friends’ house. Hannelore and Didier live in the NW part of DC. I have known them both for decades—Hannelore since I lived in Vienna after college. Visiting with them is always a treat. They live in a lovely house with a back garden that is truly an oasis. Alex, their son, was home. A rising senior in high school now, we have watched him grow up and mature. Charlotte, their daughter, is almost always off on an adventure. They all tend to roam the world from France to Austria and back again. Hannelore is the Washington Bureau Chief for the ORF (Austrian Broadcasting Corporation, the public service television channel). Didier is now retired but was a journalist for Agence Presse for many years. They have lived all over the world. In their home english, french and german intermingle from sentence to sentence. Hannelore is also an excellent cook. Every time we visit she cooks something marvelous which I happily take home to add to my own repertoire. Happily, the weather was delightful and we dined al fresco as we caught up on our respective lives. As you can imagine, life has been pretty crazy for Hannelore for quite some time now. During our visit, President Trump was in Saudi Arabia and Hannelore looked very happy to have a brief respite. She has certainly been getting more than her fair share of air time. Sunday was another quiet day. Alex is a very easy guest. He is happy to sit quietly and read. Actually, that isn’t quite true. It is somewhat difficult to get him to stop sitting quietly reading. He asserts, with some validity, that he should be able to do what he wants when he is not at work. Okay, so we sat quietly and read for much of Sunday. Sunday night my step-sister, Kathi, and her wife, Kim, joined us at the Airstream for a barbecue. We cooked burgers, beans and slaw—perfect cookout food. We sat out under the awning. Despite Cherry Hill’s proximity to the urban sprawl of DC and I-495, our site was wooded and private. It almost felt like we were in the great outdoors. We cooked s’mores for desert and enjoyed a last campfire for this journey.